Vulture at the wheel Ever since Fiat became FCA – Fiat Chrysler Automotive – there has been something a bit incongruous about the mix of brands. An Italian Jeep takes a bit of getting used to. Refined ride, exceptionally nice leather, a responsive automatic gearbox, multi-link rear suspension. It’s all a bit, well, not-Jeep. And the good things are balanced with the bad. An engine which is too small, for example. 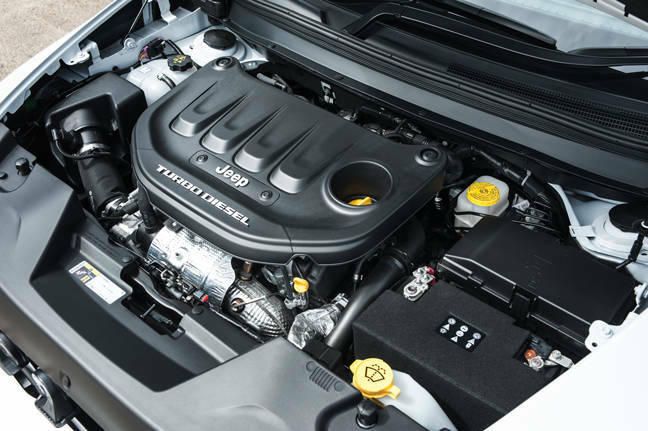 Fiat will be disappointed to read that, because what makes the new Cherokee special is that it has a substantially bigger engine than its predecessor. The 200bhp 2.2 Multijet replaces the asthmatic 170bhp two litre unit. The performance increases are substantial: 17 per cent more horsepower and with 440Nm, 25 per cent more torque – and in an SUV, that torque is what counts. But even with the power hike, it needs the very clever nine-speed gearbox to make adequate progress. If you think a Jeep should be about crossing the Rockies, forget it. This is more about conquering the speed humps and kerbs by the school gate. Given the distinct lack of Jeepness, what you find is a vehicle which ticks all the mid-size SUV boxes rather well: electric tailgate, over-eager rain sensing windscreen wipers, automatic headlights, excellent eight-position electrically adjustable seat, four-position lumbar adjustment and automatic anti-dazzle, rear-view mirror with built-in microphone. We drove the top-of-the-range, £37,995 “Limited” version, which makes you wonder what an unlimited one would be like. Jeep expects this to be the best-selling version, accounting for 70 per cent of sales. As well as the not-quite-enough power 200bhp version, there is a 185bhp one – although we’ve not driven it, you can probably draw your own conclusions. 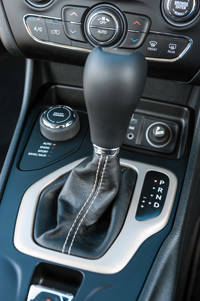 The nine-speed ZF gearbox is married to Jeep’s Active Drive system. This comes in two flavours: Active Drive I has rear-axle disconnect which improves fuel economy, while Active Drive II adds a two-speed power transfer unit, for 2:92:1 "low range" capability and hill-descent control. The car can be hustled along, and turning the selector to "Sport" makes a significant difference. It is smooth and relaxing and when it is in full-auto mode, you don’t know which gear it has chosen – but you can knock the lever into manual mode to find out. Jeep’s UConnect was the target for hackers in the US, but FCA tells us that European models have a different modem and that it's safe from that sort of knavery. The UConnect lets you monitor the car from a smartphone and has a decent five-inch screen with sat nav, but the most interesting tech innovation is the Qi wireless charger under the armrest. This did its stuff nicely with a Lumia 930. Plenty of people buy SUVs because they “feel safe” and want to wrap as much metal as possible around the cargo they are delivering to the school gate. 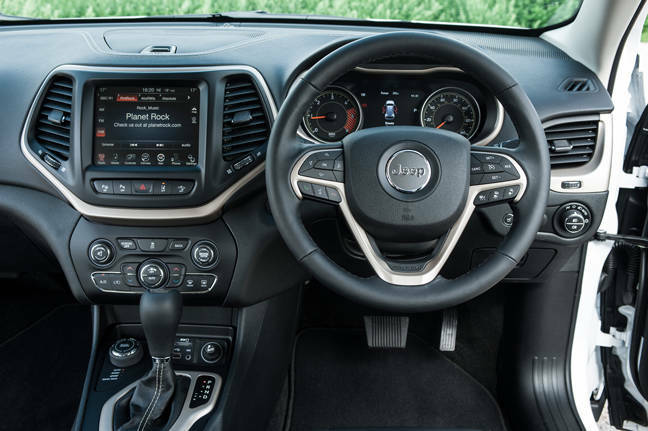 The Cherokee ticks that box with a five-star Euro NCAP safety rating and optionally a pack with advanced brake assist, lane departure warning – which is annoying – automatic main beam dipping function, forward collision warning and blind spot monitoring. In addition to the safety functions, there are some nice toys in the form of adaptive cruise control and a rear parallel parking assist system. The engine is clever and it might be Euro 6 compliant, but it just isn’t big enough. A turbocharged diesel is right for the class of car and you can make the argument that you’ll never use the top speed of 127mph, but it’s hardly the stuff of “what’ll it do, mister?”. It accelerates from zero to 62mph in 8.5 seconds (8.7 if you have Active Drive II), has an average combined fuel consumption figure of 49.6mpg and CO2 emissions of 150g/km. And that's the key to the engine. It's just big enough for the car and super economical. There is auto stop/start, of course, but it's less intrusive than on some cars, and it can be switched off. But a 2.2 doing almost 50mpg is a world away from the Grand Cherokee with its big V8. FCA would, no doubt, say that the Cherokee and Grand Cherokee are different cars, but another £1,000 gets you a basic Grand Cherokee that has a 3.0 V6. There is also the Trail Hawk version of the Cherokee which has a 3.2 V6, but the product manager described that as “specialist”. A good family car with four wheel drive to get the kids to school on the three days a year when it snows. Comfortable and economical.